The Condor Outdoor Utility Molle Pouch mounts directly onto tactical vests, plate carriers, or leg platforms with MOLLE webbing. This large utility pouch can be used to carry essential items like spare ammo or just those items you do not want to lose during a game like your car keys. 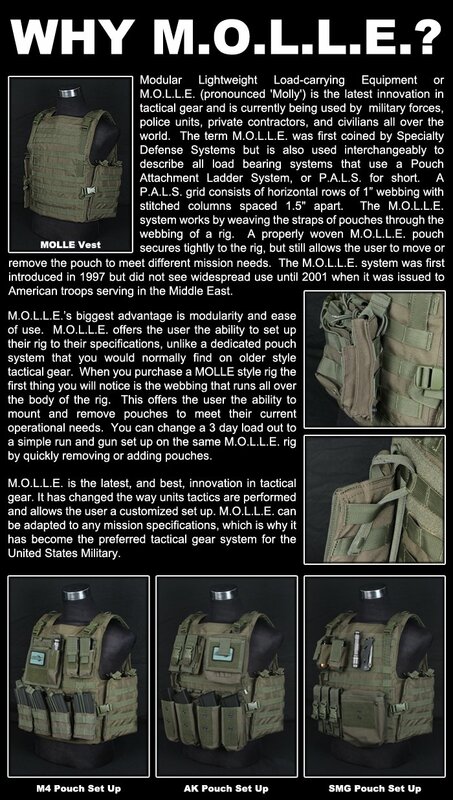 Also, along the outside of the pouch their are two rows of MOLLE webbing for the addition of pouches. This is a True Utility Pouch. I have it mounted on my Rig on the Left Side. For now, it holds my Charger, and related Gear for Charging, and discharging batteries. Only problem is, it is way too wide for is needed, often leading some to carry things that they will not be needing. One can say it is way too good, or it is way too bulky for it's purpose. It is best mounted on the MOLLE Belt as opposed to your Armor. If you are going to run this, Belting it is the better way to go, and have a Thinner, taller one on the rig for the things that you will be using most. This certainly suits the needs of some, just not all. I can say this is a top grade product, just for a different purpose. Has I purpose overall. If you wish to put your mag loader and cleaning stuff in it, that is the best suited role for this Pouch. Most known uses for it, are better done by a 3x4 or 3x6 row pouch of this type. Great pouch, have no problems with it thus far. It's wider than I expected, taking up around 6 columns of MOLLE (It has four MOLLE straps). It fits nicely on the side of my vest, taking up the entire lower half of it, though. 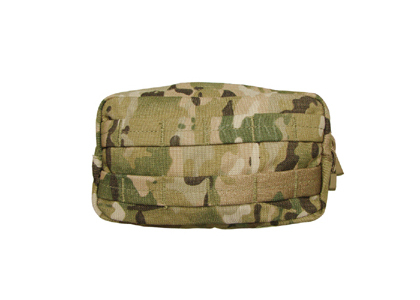 It also fits perfectly under a hydration carrier on the back of your vest/plate carrier. It's great for miscellaneous items- I keep my binoculars, speedloader, and a dummy grenade in there, everything fits nicely. This pouch is a perfect size for carrying whatever you don't trust to be left with the gear you're not using or for things you might not need but want to have on you. Toss your phone, wallet, and keys in there and you'll still have room for a charger, food bars, extra bb's and probably even an extra mag to top it all off. I mounted it on the rear of my carrier where I can just barely unzip the pouch, but a buddy can easily unzip it and remove what you need. That's what they're for! Large pouch (kind of a con too) that can fit just about anything you want inside. Well made, and sewn with a heavy weight nylon by Cordura, you can't beat durability. Fits perfectly on the rear of my plate carrier. Well, it's rather large. If your waist size is anything below 36 inches, it probably won't fit comfortably on your cummerbund. The pouch can get bulky if filled to its max, 3-4 inches wide by my guess. can i fit an elite force bottle of 5,000 bb's in this? i need somewhere to put my bb's in while I'm playing airsoft. that way i don't have people stealing my bb's like usually. A bottle of Elite Force BB's will not fit in this pouch.